Congrats to Helene for winning the Award for BEST LEAD ACTOR at the MELBOURNE WEBFEST for her performance in JEZABEL ! Jezabel is a web series created by Julien Capron and Julien Bittner. The four pilot episodes were posted on Youtube on June 9, 015. This first season has been selected at several web festivals and has attracted the attention of the New Scriptures of France Televisions and the Webcreation department of the RTBF. 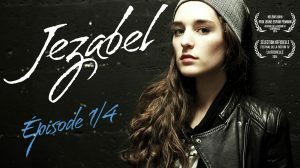 The series is centered on Jezabel (Helene Kuhn), a mute musician in the grip of a difficult love affair. But her life changed when she received a contract proposal from a major label.